Despite the unambiguous upward trend of the stock market over the past few centuries, most investors continue to achieve abysmal lifetime investment returns. 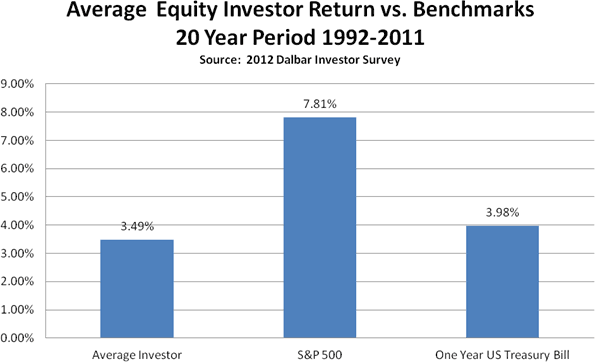 The most recent data from an annual Dalbar study show that over the past twenty years, the average equity investor's performance trailed not only that of the S&P 500 index, but also the performance of One Year Treasury Bills! In dollar terms, underperforming the broad market by 4.32% per year for twenty years resulted in a net loss of $2.5MM in capital for every $1MM invested. Although likely extremely intelligent, the average investor has no Plan, jumps in and out of the stock market in response to or in anticipation of crises, and constantly chases the "best performing" investments. This poor soul is doomed to fail before he even begins because he fails to realize that the primary determinant of his lifetime return has virtually nothing to do with his chosen investments' performance and virtually everything to do with his own investor behavior. By contrast, DEM's knowledge, experience, and disciplined approach help investors avoid these pitfalls by keeping them focused on their long term goals.